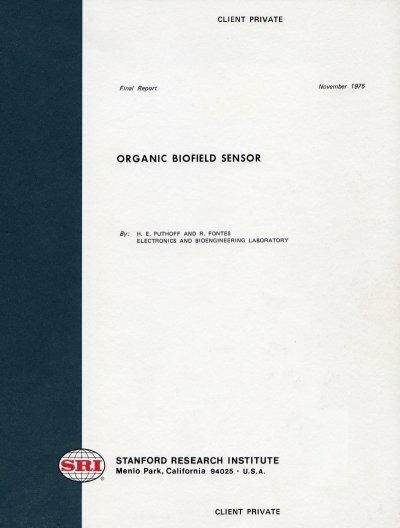 In 1973 in Santa Rosa, California Dan Kientz, Howard Vann and Ricardo Joseph developed a very excellent Kirlian Camera. They were fellow graduate students of Randall Fontes and Bob Swanson at Sonoma State University. 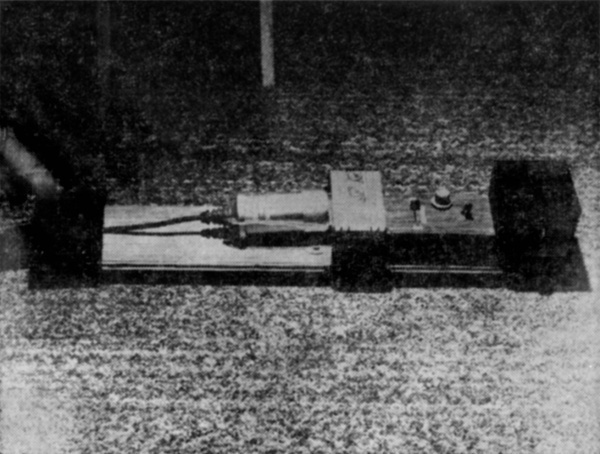 Their camera consisted of a metal plate connected to a high voltage coil mounted on a platform. Color slide film was placed on the metal plate. In total darkness Bob placed his right forefinger on the film and the power was turned on. Bob then went into meditation and the second photo was taken. The third photo was taken after coming out of meditation. DO YOU HAVE A HEALTHY AURA? PHOTOGRAPHS OF THE AURA, an energy force that some say surrounds the human body, can tell many things about a person, researchers feel. 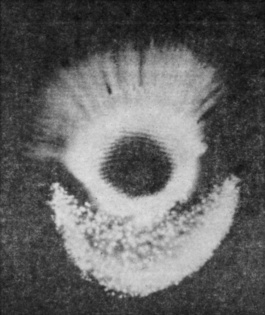 This series of three black and white Kirlian photos, all of one of Ricardo Joseph's fingertips, shows the results produced under different conditions. 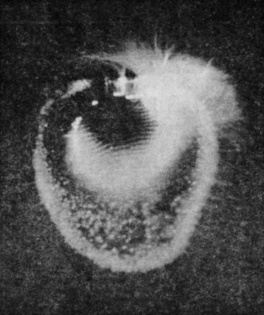 The photo at left is under normal conditions, with the aura surrounding the finger being blue. In center photo, Ricardo was angry at the time the picture was shot. 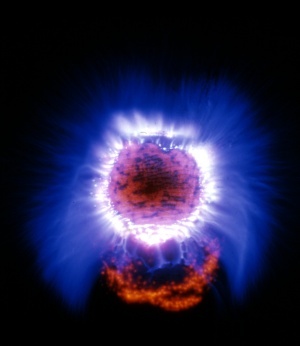 The rays have become more prominent and a large red area has developed in the aura. The third picture was made when he was coming down with the flu, and again shows a marked difference from the normal pattern, as shown in the first photo. Perhaps your aura is out of kilter and your doctor can tell what's wrong by taking some photographs. Strange as it may seem, researchers, including three students at California State College, Sonoma, think the day will come when your ills are diagnosed and health problems spotted before they occur by doctors interpreting specialized photographs of images of a mysterious invisible aura of energy which psychics say surrounds the body. This may all be possible, researchers hope, by utilizing something called Kirlian photography, through which brilliant red and blue patterns formed by the aura can be recorded on film. Interpretation of the photographs will tell something of the physical condition of the body. The same theory applies to plants, as well as animal life of all forms. 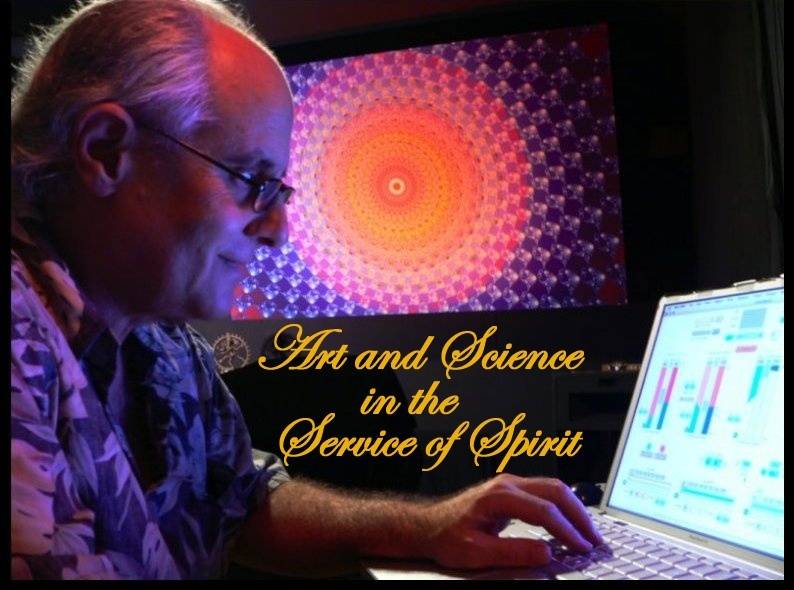 Working with Kirlian photography for several months and achieving some highly interesting results have been Dan Kientz, Howard Vann and Ricardo Joseph, who are teaching assistant in psychology and sociology classes at Santa Rosa Junior College. Their research project was originally funded by a grant from the Associated Students at SRJC. Their work began as a result of a discussion of galvanic skin response, which took place in a class at SRJC. Several persons are doing research in this country on the theory that plants have emotional feelings, and react in different ways when hooked to a galvanic skin response device (commonly known as a lie detector), and submitted to different stresses and situations. From this, research and discussion led to information about Kirlian photography, which has been going on for a number of years, especially in Russia. 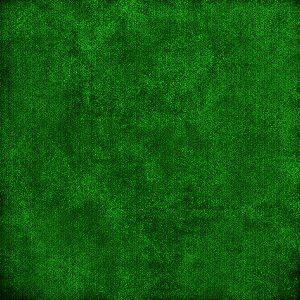 Originally the trio worked with plants, recording the aura or leaves on film. 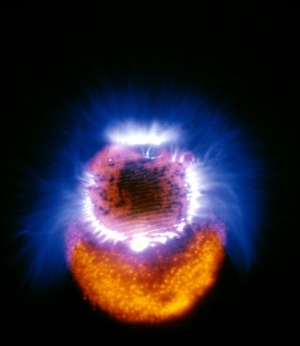 The device used for making Kirlian photographs consists of basically of a high voltage high frequency coil and an electrode. 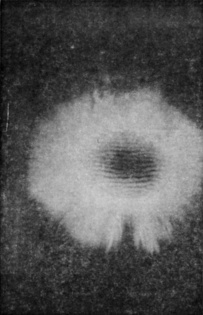 A piece of photographic film, either color or black and white, is placed on the electrode, then the object to be photographed is placed on top of the film. The device produces a coronal discharge similar to what you might see if you opened the hood of your car on a dark night and looked carefully at the spark plugs while the engine was running. 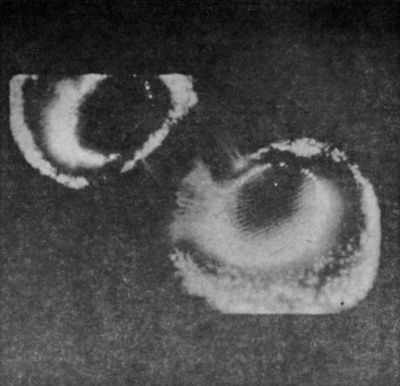 In operation, the high voltage charge produced by the coil is transmitted by the object being photographed to the film. As Kientz, Vann, and Joseph are working with unexposed film which is not in a camera, they do their work in total darkness in a photographic darkroom. They also process their own film, usually Kodak Ektachrome. 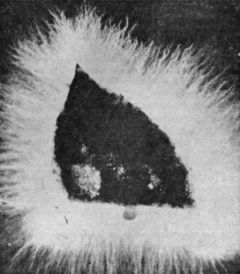 Out of necessity, much of their work has been hit or miss, as little written information is available in this country about Kirlian photography. At first, exposure was strictly a matter of guesswork, but now they have been able to standardize. 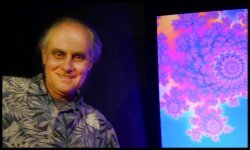 Their results have been described as "excellent" by those who have seen other Kirlian photos, including Dr. Stanley Krippner, visiting professor of psychology at Cal-State, Sonoma. Dr. Krippner is director of the Maimonides Dream Laboratory in Brooklyn, as well as director of research at the New York Institute for Child Development. 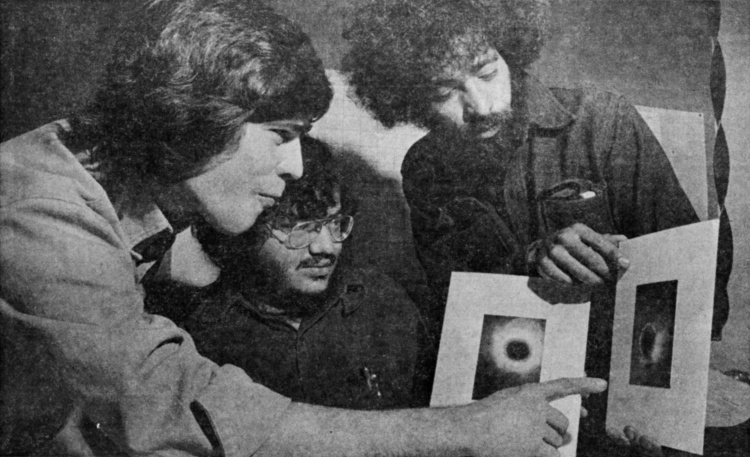 The Kientz, Vann, and Joseph photos in many instances seem to show more color than those Kirlian photographs produced elsewhere, including some used to illustrate an article in a recent issue of "Popular Photography" magazine. The project has produced interesting results. Kirlian photos made of leaves show the same colored aura as produced by a human fingertip when under stress. When stress is present, the aura photographs as red, other times it is usually blue. When a person is healthy the aura also presents a smaller pattern. As a case in point, recently Ricardo Joseph made a Kirlian photo of his fingertip. 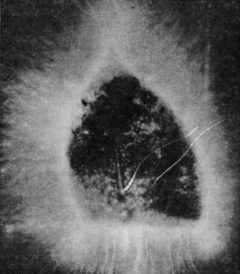 When he developed the film he noticed that the aura was larger and redder than previously, with rays shooting out violently in all directions from his finger. Within a couple of hours he was in bed with the flu. The pattern can be made to vary from normal by stress. Likewise, experiments with leaves have shown that results will vary according to how long previously the leaf was picked from a plant. Eventually the aura disappears when the leaf is dead. Presumably the aura also vanishes in time from the body of a person who has died. According to Dan Kientz, the system can be used to detect physiological and psychological changes in a person. He also feels that the Kirlian method can be used to detect a change in the physical condition of a person several days in advance of its occurrence. Currently the three are experimenting with different types of color film to see if this has any noticeable bearing on the results achieved. They are also in the process of setting up a non-profit organization, Psychotronic Research Institute, to carry out further experiments. Describing Kirlian photography further, Howard Vann said that from all indications the system is being used in Russia for detecting illness in agricultural crops, as well as in medical research. What the trio is experimenting with seems to be what psychics and mystics have been talking about for years. "It's an energy source that we really know little about, but we hope we learn more," Vann says. In the meantime they are continuing their photographing, reading all available information, and carefully recording their results. LOOKING OVER prints made from some of the Kirlian photos are, from the left, Dan Kientz, Ricardo Joseph, and Howard Vann. They have made both black and white and color exposures during the course of their project. The prints that they are examining are professionally made color prints from their transparencies. In many respects the photos resemble abstract paintings, displaying brilliant colors in unusual patterns and designs. TWO FINGERS, as in this photo, will show an inter-action of energy between them. In this case, Ricardo (larger print) Joseph and Howard Vann each photographed one of their fingers at the same time. Note the rays of energy reaching from Ricardo's finger towards Vann's. Does this mean it may be possible for a man and woman to have their fingers photographed to find out if they are "made for each other?" 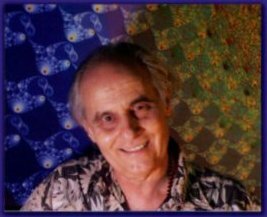 Dan Kientz, who has been working with Joseph and Vann on the Kirlian photography research project, says something like that just may be possible. Photographs they have taken indicate there is a greater inter-action of energy between some people than others, he says. As an example, he said photographs of one of his fingers and one of his wife's show a strong "energy attraction," while similar pictures matching one of his fingers with a finger of Ricardo's girlfriend revealed no attraction. 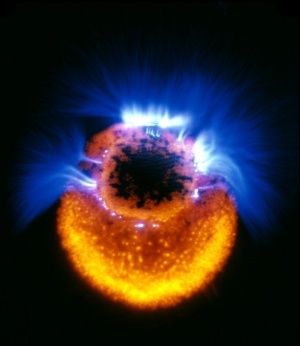 So, could Kirlian photographers in the future play Dan Cupid? Dan Kientz indicates it's at least possible. PHOTO ONE is the aura surrounding a freshly picked leaf. In time the pattern diminishes, and eventually fades as the leaf dies. 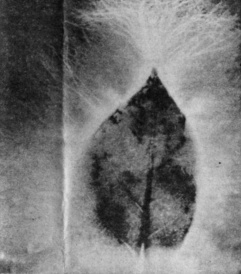 In the second photo, the leaf is seemingly responding to an emotional state projected by Dan Kientz, one of the three experimenters with Kirlian photography. At the time of second photo Kientz accidentally gave himself an electric shock with some of the equipment. The third photo, some seven minutes later, shows the leaf in a normal state again. In color, photo number two, the aura is much redder than the other two. Report Summary and Conclusions "Organic Biofield Sensor"
program to investigate paranormal abilities; code name "Star Gate"
The Play of Light is about the Beauty of Light, of Sound and of Form. As each of these is deeply resonant with the other, the underlying unity that they share is revealed within their dance; and can be realized through direct experience. Within this experience, the mind becomes still and spontaneous Meditation arises. I have developed this technique over a period of 45 years, and this is as effortless and joyful a path into meditation as I am aware of. Individual and Group sessions are available. Please call or email me, I look forward to sharing this experience with you.